Breakthroughs happen faster when your teams can gather meeting notes, documentation and inspiration in one digital workspace. The SMART Board 7000 Pro series with iQ is made for quick brainstorming sessions, and connecting remote teams on all sorts of devices. The next game changer for your business is only one productive meeting away. iQ technology lets your team switch from whiteboard to presentations to engineering applications and more – right at the board. Exclusive HyPr Touch™ technology lets you write and interact with on-screen content with no lag – whether you’re using a pen, eraser or a finger. Teams can‍‍‍ write in red, green, blue and black ink at the same time, so you can see who contributed what. SMART Board 7000 series delivers an identical experience on both Mac and Windows operating systems. With up to four pens, ten fingers and two erasers doing different things at the same time, more people on your team can contribute at once. The 7000 series warms up when you walk into the room, and turns on instantly when you press power or pick up a pen. Make sure your pitches look their best. The SMART Board 7000 Pro series comes with an HDMI 2.0 port to show 4K video (not just images) from laptops and other devices. The SMART Board 7000 Pro series is as easy to write on as paper. You can add notes to virtually everything you can show on the board. Write over websites, videos, PDFs and Microsoft files and save your notes in almost any file type with SMART ink™. Capture screens. Change ink colours. Use presentation tools. Convert writing to text. SMART ink™ gives your team one-touch access to these features and more. A smooth writing experience produces lines with curved edges that look like natural handwriting. The SMART Board 7000 Pro series comes with four pens, so it’s easy for colleagues to work side by side on projects. It’s a whole new brainstorming experience. Working together on the next big thing for your business is easy and fun when colleagues can move objects, type on the screen and tap to select at the same time. Meeting going long? An ultra-smooth Silktouch™ finish allows your team to use the board for hours without finger burn. 16 simultaneous interaction points let your people do different things at the same time with pens, erasers and fingers. Fingers select. Pens write. Palms erase. Object awareness™ means your SMART Boards know the difference automatically. Spark discussions. Fine tune presentations. Wow clients. The SMART Board 7000 Pro series connects everyone and everything because ideas aren’t tied to any platform. Share any Android, Apple and Windows device with the board. No apps. No cables. No extra computers. It’s simple to use right out of the box. Every pitch and presentation looks crystal clear in 4K Ultra HD resolution. iQ technology makes it really easy for everyone to share their devices with the board. 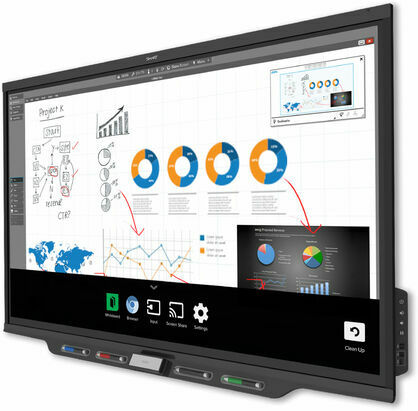 SMART Board 7000 Pro series is a collaboration hub for all sorts of devices. Presentations and notes pass from PCs, phones and tablets at light speed. Meeting Pro® room and 10 Meeting Pro® personal subscriptions included. WHITEBOARD: Just walk up and start writing. Your team can save notes to any mobile device with a tap, and send them back to the SMART Board during their next meeting. SCREEN SHARE: Share any Android, Apple and Microsoft device with your SMART Board 7000 Pro series with just a few taps without any apps or extra hardware.